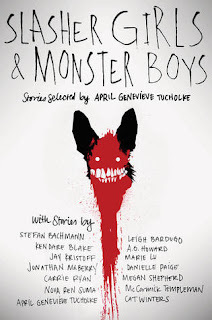 At first there didn't seem to be much of a clear theme to this anthology beyond, well, thriller and horror stories. The line-up of authors is excellent--Leigh Bardugo, Nova Ren Suma, Carrie Ryan, A.G. Howard, Jonathan Maberry, Kendare Blake, Jay Kristoff, Marie Lu, Megan Shephard, McCormick Templeman, April Genevieve Tucholke, Cat Winters, and Jay Kristoff. All authors known, if not for horror, then for their creepy or dark or suspenseful novels. The tagline on the front says "Classic Tales, Brand-New Nightmares" which, frankly, was super confusing as, at first glance, the stories don't appear to based off of any particular tales, like the anthology Rags and Bones: New Twists on Timeless Tales. But a closer look at the end of each story reveals an upside-down footnote that details each story's inspiration--usually a classic horror film or story, and sometimes music. Some of these inspirations are clear, but some are a little more subtle--which is great! Most of the stories' inspirations are from Western culture, specifically American 20th century pop culture, and they pull in interesting tropes and urban legends that make up modern horror and suspense lore. The range is impressive--historical, contemporary, paranormal, fantasy, and a twisted form of magical realism. And as I read through the stories, another theme of female empowerment emerged--female empowerment that often came in dark, unconventional, or morally questionable places, which made so many of these stories unsettling. My favorite stories were "The Birds of Azalea Street" by Nova Ren Suma and "Fat Girl With a Knife" by Jonathan Maberry. They were smart and sharp and they fit the short story form perfectly. A.G. Howard and Carrie Ryan wrote stories with premises that were seriously so creepy that I shivered while reading them. I did feel as though this anthology was more miss than hit with me, but it was creepy, sometimes violent, and overall an interesting collection of things that unsettle. No matter what it is that raises your pulse--blood, high stakes action, ghosts, murder, or mind games--there is definitely something in this book that will make you hesitate to turn the lights off at night.